Nguyen Thi Luu didn’t see the train coming. When it hit her, she was dragged along the tracks before bystanders were able to help her. The Hanoi resident, who had been on her way to work, was lucky to survive. But she lost the use of her lower right leg and it had to be amputated. Now, with the help of a low-cost prosthetic leg developed by University of Melbourne researchers, Ms Nguyen is back on her feet again and able to enjoy a normal life. “I can walk, jog, travel. I can climb the mountain. I’m not afraid of anything,” she says. Professor Peter Lee helps Nguyen Thi Luu with her new leg. Ms Nguyen is one of about 35 Vietnamese patients who have been helped by the Pressure Cast (PCAST) prosthetic socket technology being trialled there by a University of Melbourne team led by Professor Peter Lee, from the Department of Mechanical Engineering. Professor Lee says that as an engineer working in the developing world, it was rewarding to see how the technology had helped patients like Ms Nguyen. “It is certainly very satisfying to see. We initially fitted her about two years ago and she was still wearing the PCAST when we saw her again for the latest trial. She has been a very consistent PCAST user,” says Professor Lee. PCAST is a unique process that allows prosthetic limbs to be created within a day, offering particular advantages for patients in remote and developing regions, where highly qualified prosthetists are either unavailable or unable to meet the intense local demand for prosthetic limbs. 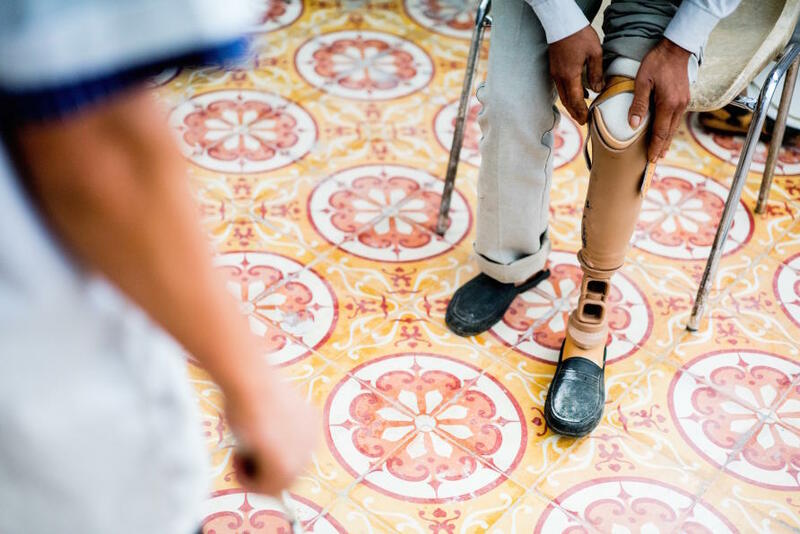 This situation is compounded in Vietnam, where the prevalence of landmines, as well as high rates of motor accidents, lead to critical levels of demand for low cost prosthetic legs. The prosthetic socket is the most vital component in an artificial leg. It is the part of the replacement limb that must bear the load of the wearer and fit his or her body exactly. It needs to be comfortable, yet provide adequate support during standing and walking. Current technology requires a qualified prosthetist who can shape the socket manually; a process that can be labour intensive and time consuming. The PCAST system works by using a portable unit that can create a customised socket for prosthetic legs without the need for specialist technicians. The patient’s stump is first wrapped with Plaster of Paris and placed inside the PCAST unit. The PCAST unit then uses water pressure to create a custom socket shape that will allow the new leg to bear the patient’s weight comfortably. Professor Peter Lee and PhD student Sheridan Laing fit Nguyen Thi Luu with her new leg using PCAST technology. “The initial motivation for the project was the high number of amputees in Cambodia and Vietnam, which are affected by landmines,” says Professor Lee. Professor Lee and his team, including PhD student Sheridan Laing, prosthetist Jim Lavranos from Caulfield Hospital and Associate Professor Noel Lythgo from RMIT, have been working on the PCAST project trial with the Vietnamese Training Centre for Orthopaedic Technologists (VIETCOT) in Hanoi. Professor Lee says the PCAST technology was not aimed at replacing prosthetists. “This is about solving some of the problems that are unique in developing countries where there are too many amputees and not enough professionals working in the field. Professor Lee says that the other key advantage of the PCAST was its portability, meaning it could be taken into remote areas, or regions affected by war or disasters, in order to quickly produce prosthetic limbs. Professor Lee is working with the support of CASS Foundation, Rotary Club Richmond and Sweden’s Promobilia Foundation. He is looking to work with other industry partners to roll out the technology to other developing countries such as Cambodia and Laos, where land mine and traffic injuries means that low cost prosthetics are urgently needed. As Melbourne marks the death of Sisto Malaspina, who was killed in the terror attack on Bourke Street, how do you effectively talk to kids about terrorism and violence?